These are my favorite newsletters -- discussing a new formula. It's fun, not just because of the subject matter, which is definitely interesting, but also because I don't have to write anything new -- just grab it from the twelve months of research that went into the Barron Report related to the project and drop it in down below. I hope you enjoy it too. Because no one solution works for everyone! That's so important, I'm going to repeat it one more time. No one solution works for everyone! If Glucosamine and Chondroitin already work for you, then this report is not for you (necessarily). If CMO does the trick, same thing. If you're happy with Proteolytic Enzymes or Essential Relief™, this probably is not for you (most likely). But if they haven't worked, or if you still suffer from chronic pain, and the only help you've been able to find is from daily doses of aspirin or prescription drugs, or if you're concerned about more than just the pain issue and are looking to prevent further degradation of your joints, then read on. Over the past twelve months, I have been working on a formula that incorporates some extraordinary new research on natural pain relievers -- 3 substances that not only relieve pain, swelling, and stiffness, but that when used in combination can also help rebuild damaged joints and tissue. This formula offers a three pronged approach to systemically relieving chronic joint pain and inflammation. And it makes use of ginger's ability to directly reduce pain and inflammation. In order to understand what ASUs are (apologies to Arizona State University) and how they work, we need to make a minor detour and talk about aggrecan. In fact, this discussion should help tie together some of the supplements that you may already be familiar with. Aggrecan is the acronym for a small bio-chemical molecule called, oxymoronically, the large aggregating chondroitin sulfate proteoglycan. Specifically, an aggrecan molecule consists of a protein backbone which is attached to up to 150 chondroitin sulfate chains and 60 keratan sulfate chains. 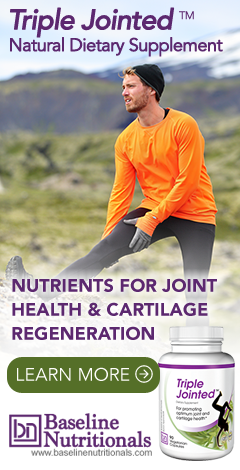 Aggrecan is abundant in the human body and represents up to 10% of the dry weight of cartilage -- keeping in mind that's quite substantial since articular cartilage (the cartilage found at the end of long bones) contains up to 75% water. As many as 100 of these aggrecan monomers will then interact with hyaluronic acid molecules to form a single massive chain called an aggregate, which is a key component of joint cartilage. Several years ago, researchers from the University Hospital in Liege, Belgium reported in the August 2003 issue of The Journal of Rheumatology that a phytosterol/sterolin extract concentrated from the oils found tightly bound to avocado and soybean fibers could significantly boost production of aggrecan, thereby helping slow down and even repair some of the damage caused by osteoarthritis -- in as little as nine days. One thing to keep in mind is that most tests with ASU have been run with purified versions of ASU. But the non prescription versions available to the general public are only about 30% phytosterols and sterolins by content. That means when used in a supplement, you will want to use 1000 mg a day as opposed to the 300 mg cited in the tests. Most ASU supplements do not make this distinction. It should also be noted that some people do not "feel" anything when using ASUs, nevertheless, they may still be benefiting. Since ASUs can slow, and in many cases even reverse, cartilage degeneration, improvement may be happening even if pain persists. Rheumatoid arthritis (RA) is a common autoimmune disease in which killer T-cells of the body's own immune system (most likely triggered by invading bacteria) reprogram themselves to attack joint cartilage, resulting in inflammation and joint destruction. The current treatment strategies of suppressing immunity and inflammation offer only limited success. "Oral tolerance," on the other hand, is a long-recognized mechanism for inducing immune tolerance -- that is, suppressing a misdirected immune response. But rather than suppressing the entire immune system, oral tolerance targets specific immune cells responsible for tissue damage. Inducing the immune system to tolerate joint cartilage, rather than identifying it as a "foreign" substance, requires a specific sequence of events to take place within that part of the immune system found in the gastrointestinal tract lining. Studies have shown that small doses of undenatured type II collagen can indeed trigger this particular sequence of events, thereby deactivating killer T-cell attacks of joint cartilage in humans. Other studies have demonstrated that the undenatured type II chicken collagen found in UC-II retains its activity when exposed to human digestive fluids, which is not necessarily true of other sources. Time-dose measurements by ELISA immuno-assay of UC-II activity have shown that it retains approximately 50% activity even after as long as 90 minutes after exposure to digestive juices. Most type II chicken collagen sold in dietary supplements is denatured, or hydrolyzed, which is another way of saying that the chemicals and high-heat used to process and refine it have changed its molecular configuration. An undenatured extract is made using little or no heat and limited processing. It is usually extracted using pepsin with just enough processing to concentrate the collagen and make it soluble. Denatured or hydrolyzed extracts, on the other hand, typically use high heat, acids, and enzymes to make the protein molecules more soluble; but these methods fundamentally alter the structure of the protein. Denatured proteins are often called hydrolyzed proteins -- thus denatured collagen is often called hydrolyzed collagen. This does not make it useless. Hydrolzyed type II chicken collagen still has value as a source of some of the components of aggrecan, including collagen itself, hyaluronic acid, chondrotin sulfate, and glucosamine. But to receive this benefit you need to consume it in large amounts, as much as 3-10 grams a day. But more importantly, one significant thing does change in the process of denaturing. When denatured, type II chicken collagen loses its immunomodulating ability. Type II collagen must be in its native (undenatured) form to be effective in this capacity. When we talk about a 10 mg dose, we're talking about 10 mg of active glycosylated undenatured type II chicken collagen. But there are no readily available pure sources of this component. Standard hydrolyzed chicken collagen, as explained earlier, has virtually none. And most sources of undenatured collagen offer it in the range of 10-25% concentrations. In UC-II, for example, active glycosylated undenatured type II chicken collagen comprises 25% of the whole. That means it takes 40 mg a day of UC-II to get 10 mg of active undenatured collagen. I have noticed that several of the supplement providers who are using UC-II in their formulas have mistakenly used 10 mg of UC-II itself. That means they are only providing 2.5 mg of active undenatured collagen. Given the cost, I can see why, but from your perspective, you want a full 10 mg, which requires 40 mg a day of UC-II -- or more from other sources. There are two cyclo-oxygenase (COX) enzymes present in the human body, COX-1 and COX-2. The COX-1 enzyme is found in most tissues and is necessary for a variety of important internal functions, such as protecting the stomach lining, maintaining renovascular function and platelet aggregation. The COX-2 enzyme, though, has an entirely different function. It is a necessary component of the inflammation process, which is a normal, healthy attempt by the body to heal itself. However, when inflammation gets out of control (such as in the case of arthritis or other chronic inflammatory disorders), ongoing pain and discomfort is the result. Prescription COX-2 inhibitors such as Vioxx and Celebrex have proven helpful in relieving out of control inflammation and its accompanying pain -- but with notable side effects such as an increased risk of heart attacks and strokes. That's where botanical COX-2 inhibitors such as ginger can help. Botanical COX-2 inhibitors block the action of the COX-2 enzyme in much the same way as prescription drugs do, but without the side effects. As I mentioned at the top of the report, if Glucosamine and Chondroitin already work for you, then this formula may not necessarily be for you. If CMO does the trick, same thing. If you're happy with Proteolytic Enzymes or Essential Relief™ this most likely is not for you. But if they haven't worked as well as you might like, or if you still suffer from chronic pain, and the only help you've been able to find is from daily doses of aspirin or prescription drugs, or if you're concerned about more than just the pain itself and are looking to prevent further degradation of your joint tissue, then this formula just might be what you're looking for. I commented in a letter to a friend that tart cherry helped relieve the pain in my fingers. She thereupon said she had surery on one of her knees and is having pain in both knees due to arthritis. I have never heard of this 3 pronged approach and am not wholly knowledgeable about the above information. What is the best way I can refer her to direct to someone who can help her? Obviously not the orthopedist who did the surgery. Or is there supplements that she could take along with your article under an MD's direction? Thank you. All of Jon Barron's recommended formulas and the companies who sell them can be found under our "Products" page above (top navigation bar). For this article, looks for "joint enhancers." Good article and positive three pronged advice. I have read enough studies and trials in the ENTREZ database that validate the use of these products for me to consider the combination part of my daily regimen. Today, I take a number of supplements that when combined seem to work wonders at keeping me feeling and looking much younger than my chronological age. All pain management doctors want to do is inject steroids in your joints and back or prescribe, as reported here, harmful NSAIDS or other prescription drugs that cause so much other biological damage as their only answers to the aging pains caused by inflammation from various causes. Here is another alternative... I was having severe shoulder pain and joint popping caused by an age related loss of the synovial fluids that lubricate our joints. Insurance would only pay for the doctor to inject steroids to relieve the pain. NO WAY! I fought them and was able to take part in a trial where the pain management doctor injected an HA (hyaluronic acid) compound called Synvisc. My research had indicated this safe and effective treatment approved for the knee would work for the shoulder as well. It was being done in Europe. The improvement was nothing less than amazing in about a month after having a series of two injections over a one week period. It is now two years later and my shoulder is as good as new. I am turning 64 and work out with significant weights to maintain my body composition. More recently, I was having some sharp knee pain but could see that the knee was working fine. I had no direct injury to the knee other than the stress caused by certain exercises I do every other day. It felt as if I had a bad bruise on the inner side of my knee. The pain was lasting for days and I am about to consult with the doctor who fixed my shoulder when by pure chance, I ate a bunch of cherries that night. Well, when I awoke the next day the pain had been reduced by about 80%. Research supports this result. My wife fractured a vertebrae 7 months ago. Doctors advised letting it heal by itself, and she should be OK in about 3-4 months. Not happening. She is in pain every day, has trouble walking any distance and is hunching over constantly from the discomfort. Doctors say " X-rays show it must be healed by now. Pain is probably from the inflammation of the muscles surrounding the fracture. Take such and such, etc.). Not helping.